The farm is closed until summer 2019, but you may place an order for frozen blueberries! One of life's guarantees is that the sun always rises. Each dawn provides another day. A new opportunity to begin and more importantly, a reminder that the LORD's mercies are "new every morning" (Lamentations 3:23). As a producer of food, it is our aim that your produce can taste as fresh as possible just like the freshness of a beautiful sunrise. 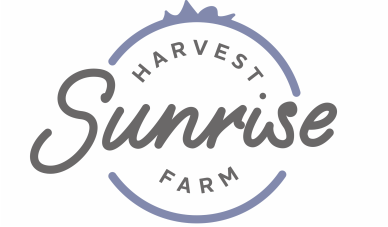 Sunrise Harvest Farm is family owned and operated. Thanks for visiting our website and hope to see you soon! Experience the farm this summer by coming and picking our delicious, healthy fresh fruit! Want a box of fresh picked blueberries or a bag of frozen blueberries? Conveniently order online! Homemade Blueberry Jam, Blueberry Sauce and Pancake Mix! Order here to pick up locally or order on Etsy to have shipped to you!